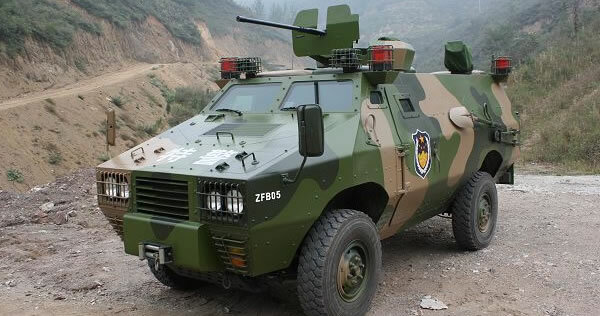 The Chinese ZFB05 4×4 Wheeled APC Family was developed by the Shaanxi Baoji Special Vehicles Manufacturing Company. 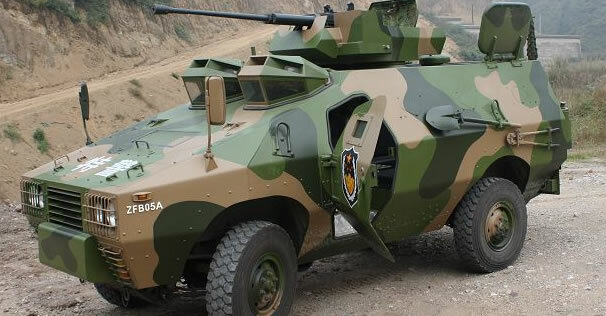 The Armoured Personnel Carrier is made up of an armoured body (proofed against 7.62mm rounds) fitted on to a NJ2046 military truck chassis (which is a copy of the Italian IVECO 40.10 aka VM 90) and adapted to in a number of different variants. The APC has a x2 crew and x7 troops in the rear who exit the vehicle via doors in the sides and rear, which has a firing port. A traversable mount can be fitted to the roof of the cab structure capable of mounting Machine Guns of up to 12.7mm calibre, with a shield to protect the gunner. The vehicle is powered by a turbo-charged diesel engine giving a top road speed of 110km/h and an operational range of about 850km’s. The vehicle has been operated by the PLA on joint UN Peacekeeping Missions to both Haiti and Lebanon. Its believed that the vehicle has been exported to undisclosed African Nations. The ZFB05A is an upgrade version of the basic version of the ZBF05. This version is more protected than the ZBF05, the two windows mounted to the front of the crew compartment are replaced by hatchways. The ZBF05A uses also a new 4×4 chassis.